Details of death: David suffered a fatal heart attack Saturday 15th January 2005. At only 47, he was at the top of his much-loved career and will be greatly missed by his family, friends and colleagues around the world. There is, perhaps, a little good news. Although David had shown no symptons previously, the post mortem revealed that he had advanced lung cancer. It was the pressure of the growth upon his heart that caused the attack. As Vanessa says, far better that should die the way he did rather than suffer a long, painful death confined to a bed and an oxygen cylinder. That would never have been David's way. David's career in balloons started in 1995 while he was working as a supermarket manager. He was interested in Magic, and had done some face painting and balloon modelling. The real turning point for David was the 1996 Christmas and Party Show at Olympia in London. It was his first visit to a trade show and he was totally thrilled by the balloon competitions - thrilled and inspired to learn more. He went home and practiced, and though he had no formal training, he was convinced he could be a top-notch balloon artist. After winning several industry awards, David started teaching at the 1998 Party Show. He really enjoyed the teaching side of the job and set out to develop his skills, mainly through the magic societies and the Magic Circle in London. In 2000 he was asked to run courses for Pioneer Balloon Company and obtained his Certified Balloon Artist (CBA) and became a Qualatex approved instructor. After winning the Entertainer of the Year award at IBAC, David's name became internationally known, which brought him work and teaching opportunities all over the world. 1997 - First place in the Non-Round and the Logo categories at the Party Show held at the NEC, Birminghaman, and second place in the Giant Sculpture. 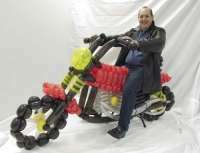 He awarded Balloon Decorator of the Year in his first year of serious competition. 1999 - Decorator of the Year again at the Party Show. 2001 - IBAC 2001 held at Chicago, USA, Entertainer of the Year and won 3 first places and one third place. 2002 - Millennium Jam in Mol, Belgium named European Entertainer of the Year. Makes big stuff Produced 9 instructional videos and appeared in several issues of Balloon Magic - The Magazine. When I'm twisting, I get more fun out of it because I'm making people happy and getting lots of lovely smiles. I was stunned by the number of awards David won in both Round and Non-round categories, it was just remarkable. I was also struck by how gracious he was as a winner, that was really refreshing. - Marie Mandoli of The Balloon Lady in San Francisco, CA, USA. If you have corrections for the above, or interesting facts or anecdotes to add to the entry, please let us know.